After the upcoming elections in Armenia, it will become even clearer how ready this country is for peace and stability, said Azerbaijan's Foreign Minister Elmar Mammadyarov addressing the meeting of foreign ministers of the Eastern Partnership countries. Mammadyarov noted that 2018 is a very fruitful year in terms of the development of the cooperation agenda with the European Union. "The adoption of the document on the priorities of the Azerbaijan-EU partnership is one of the most important stages of bilateral relations. I hope that this document will provide the necessary framework for sectoral cooperation for 2018-2020," Mammadyarov said. He also noted that the European Union is still the main trade partner of Azerbaijan, and that about 50 percent of foreign trade turnover falls to its share. "Over the past few years, the EU has made investments in Azerbaijan in the amount of $15 billion. There are more than 1,500 companies from the EU operating in Azerbaijan," the minister said. Mammadyarov also noted that the recent expansion of the maps of the Trans-European Transport Network (TEN-T) in the field of transport can create a solid platform for the development of transport and trade dialogue. "Here I would like to note the need for the imminent completion of a long-term investment action plan," the foreign minister added. Elmar Mammadyarov also touched upon the Armenia-Azerbaijan Nagorno-Karabakh conflict. He said that conflict resolution is one of the most important issues for the sustainable development of the region. "Two meetings I held with my Armenian counterpart, the conversation held between the President of Azerbaijan and the Prime Minister of Armenia gives us a positive impetus to move forward. After the upcoming elections in Armenia, it will become even clearer how ready this country is for peace and stability, and first of all, it means the withdrawal of Armenia’s troops from Azerbaijan’s territories. 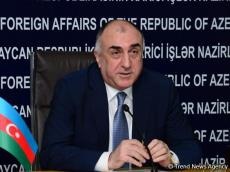 Azerbaijan, in turn, as repeatedly stated, is ready for substantive and results-oriented negotiations,” said Elmar Mammadyarov.